We got our first Dobermann in 1994. It was Manfred Air Tellus, out of the German male Idomeneus v.d. Barlinge and Kibella De Gor, a daughter of amazing Melvas Muro v. Birkenhain. Since then, our family can hardly imagine living without a Dobermann. We decided to our next Dobermann from the German kennel vom Hanseaten. The puppy- Bombastic was out of well-known young male Gino Gomez del Citone and beautiful Chendra Novalis, she had become a repeated winner of shows in Germany and outside. We made no mistake. 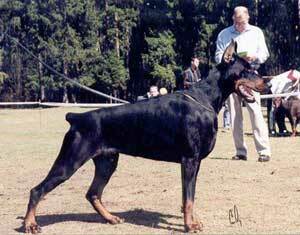 A great champion and perfectly working Dobermann, that had sociable behaviour in everyday life, grew from the little funny puppy. Having lost Bombastic we decided to establish a kennel with the idea of preserving his super-social behaviour. The aim is also to breed dogs having the appearance advantages of Bombastic and such his predecessors as multi-champion Baron Brayn v. Harro`s Berg, Gino Gomez del Citone, Arielle D`Amour del Citone, Mia v. Norden Stamm and other. To achieve this goal we use the best of German pedigrees. We cherish hopes for having the offsprings as successful as great Bombastic was.